Saffron Walden Town Library – this is situated upstairs at the library in Market Square, and offers thousands of reference books and archival resources for visiting researchers. 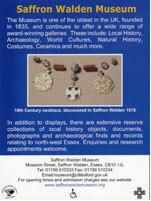 Saffron Walden Museum – the Museum has a wealth of displays, including the history of the town and local areas. Documents from its archives can be viewed but by appointment only. The Museum Society website has details of events and exhibitions at the museum. 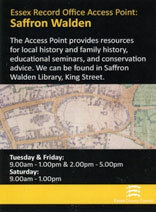 ERO Archive Access, Saffron Walden Library – the local branch of the Essex Record Office which is staffed on Tuesdays, Fridays and Saturday mornings. At other times when the library is open microform facilities are available by self-service. Essex Record Office – the ERO in Chelmsford conserves a vast range of original documents relating to the town and villages. No appointment is necessary, but requests for documents can be sent in advance via the SEAX catalogue of holdings. Tourist Information Centre – the TIC at Saffron Walden stocks a wide range of history books, maps, local information and souvenirs and can also arrange local accommodation for visitors. 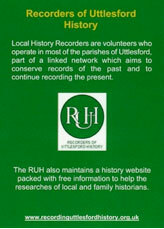 Recorders of Uttlesford History – the RUH is a network of Local History Recorders and other historians which covers most of the towns and villages of NW Essex. 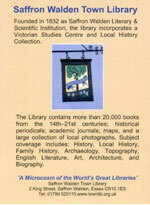 They offer an excellent website packed with historical articles, and includes further links to local history societies. A good site for old Essex maps.